Police are investigating after a man was left with a 'serious head injury' following an altercation about littering. Officers said they would like to speak to a man caught on CCTV in relation to the assault outside a takeaway in Middle Street, at 1.10am on Sunday (June 10). Sussex Police said: "The 40-year-old victim and his friends were eating some chips outside when a man nearby threw his chips on the ground. The group challenged him about using a litter bin and he approached the victim and pushed him in the chest. He fell back onto the pavement and hit head causing two suspected bleeds on the brain. "The victim was taken to the Royal Sussex County Hospital, Brighton, where he remains for treatment. 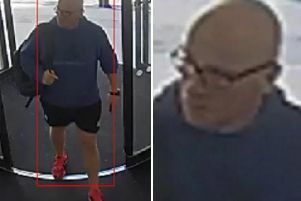 The suspect is white, aged in his early to mid 20s, 5’ 8", slim, light brown hair with a side parting, a full light brown beard and was wearing a blue button up shirt." Detective Constable Jon Moore said: "We are keen to speak to the man on CCTV about this incident and would like to hear from any witnesses. Please contact us." Contact police online or call 101 quoting serial 10 of 10/06 if you can help.